Tymon Mellor: In 1955 mineral prices were on the rise and there was a large influx of new population into Hong Kong, mineral extraction and mine development was a growth industry. Sensational mining stories and corruption were not uncommon. 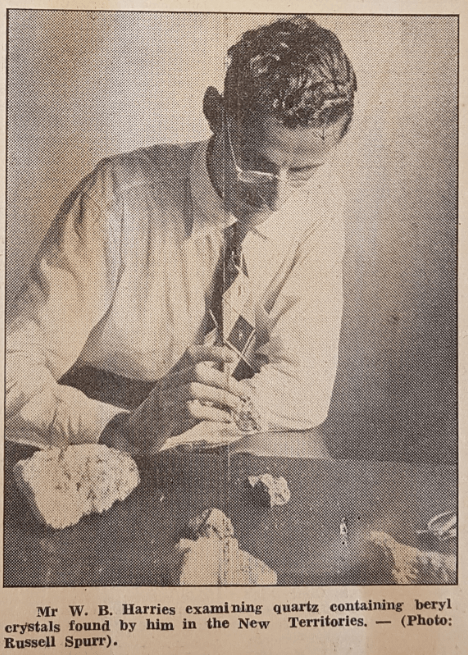 In April, 1955 an amateur geologist, Corporal William Bruce Harries, of the Royal Army Educational Corps discovered a deposit of Beryl at Devil’s Peak, and was immediately engulfed in sensational stories about the development and value of the find. 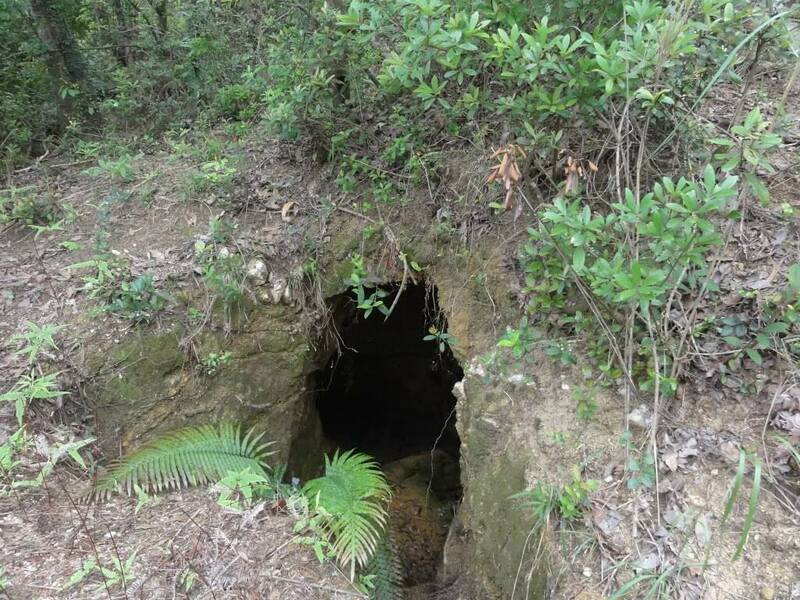 This article discusses abandoned mine workings, the entrances, tunnels and adits have not be maintained in over 50 years and their condition is unknown. These workings should not be entered in to as they may be unsafe. Corporal Harries, having found the mineral deposit in the Devils Peak area, was keen to exploit the find, however as a servant of the Crown he was debarred from obtaining a prospecting licence. Thus, he contacted a number of local mining interests and in April, 1955 the Far Eastern Prospecting and Development Corporation Ltd, an associated company of Wheelock Marden & Co Ltd applied for a prospecting license for 346 acres in the Devils Peak area. 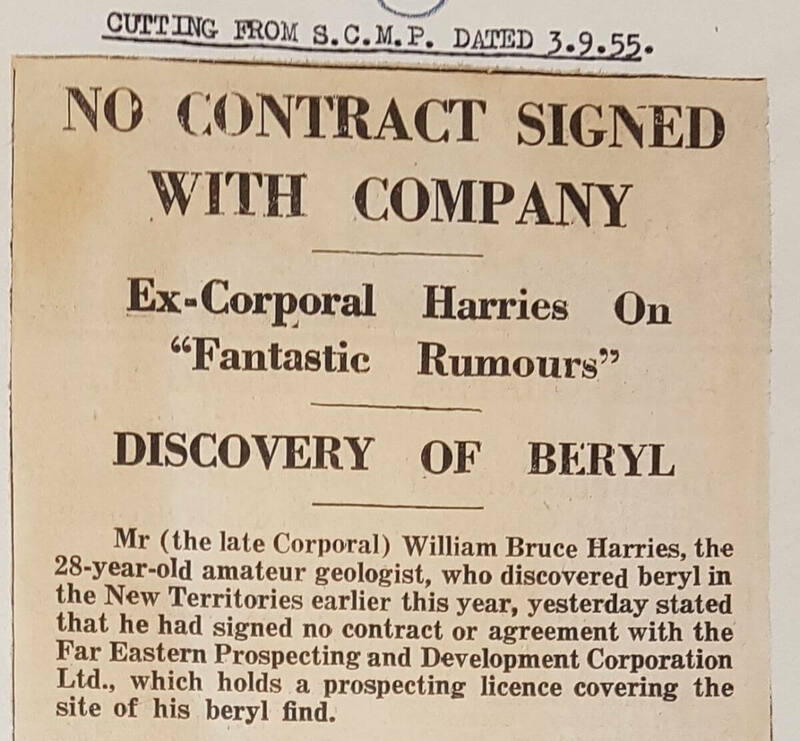 The prospecting licence was issued on the 16th May, 1955 and Corporal Harries was lined up to be the geological surveyor, once he could arrange his army discharge. The map below shows the known mineral veins in yellow and the known mine entrances in red, there are probably more. The green beryl mineral crystals were up to 0.3m in length and 27mm in diameter. The mineral was used in what was a growing industry in the 1950’s, atomic energy programmes and within high strength alloys. Horizontal and inclined trial adits were cut into the hillside to locate or follow the mineral vein. According to the South China Morning Post of the 3 September, 1955 the value of the ore had been exaggerated and was “nothing like the price of US$50,000” per ton quoted, the actual value for ore with 10% beryllium oxide being US$380. The development company wished to correct the reports on the value of the ore as they were concerned the high values would encourage illegal prospecting in their area. 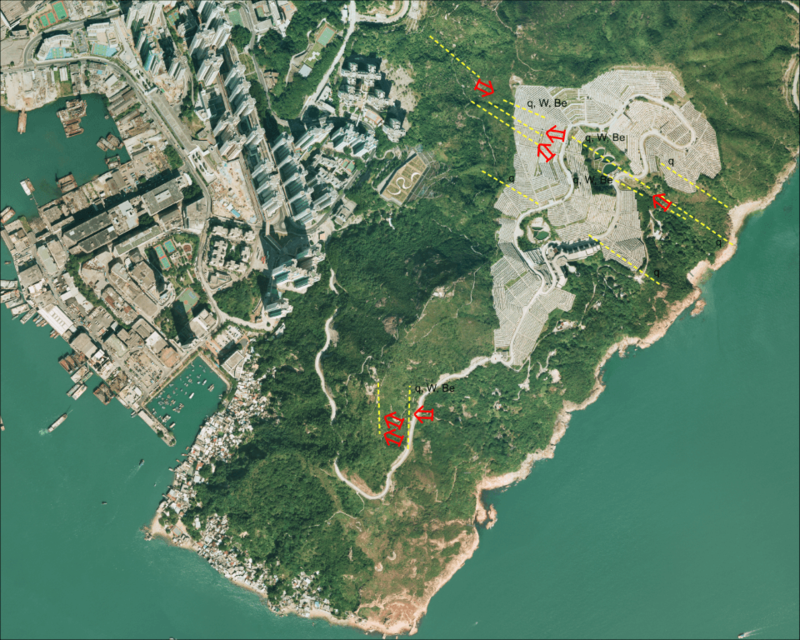 Two samples from the Devils Peak find were analysed in the United States and showed varying mineral quantities from 4.3% to 13.9% beryllium oxide. This was sufficient to support development of the mine using hand excavation methods and the beryl crystals extracted from the crushed rock by hand. 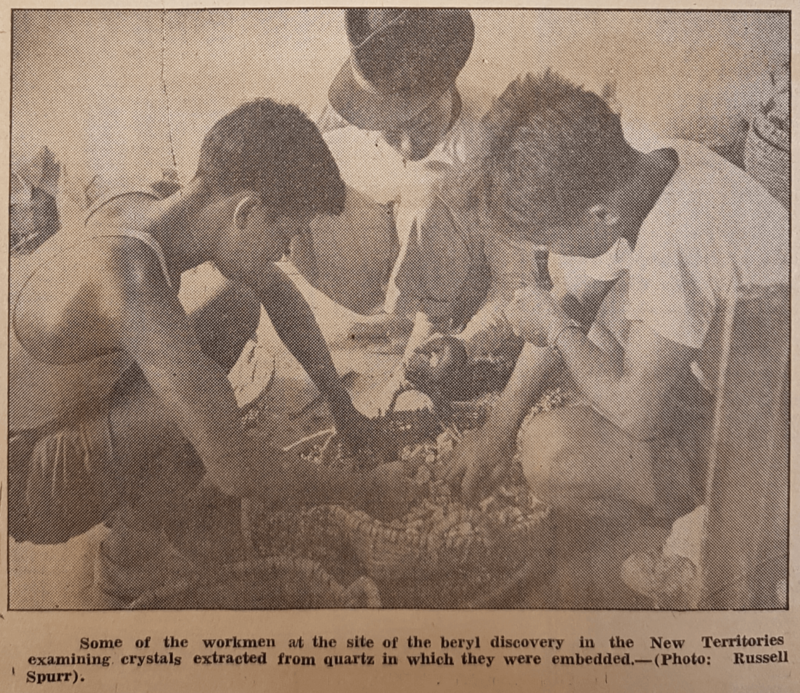 Prospecting for the ore continued for a number of years but by 1959 with no significant discoveries that could be economically exploited, the workings were abandoned. What happened to Corporal Harries is not recorded, but he was intent on staying in Hong Kong, may be you know of him? This article was first posted on 25th August 2017. Greetings from the UK, and thank you for a fascinating article. I am currently researching my family tree, and among some of my grandfather’s documents I discovered a mini-autobiography in which he explains that, while he served in Hong Kong with the RAEC in 1952-55, he ran classes in geology and mineralogy for service personnel and their families. There is no mention of Cpl. Harries by name, but my grandfather did mention (in very modest terms) that the discovery was made by one of his students and that he himself “identified the first specimen and deposits” of beryl found in Hong Kong. I should mention that he was a very keen gemmologist and FGA, so he knew what he was doing. I wanted to learn more about the subject, and stumbled across this very enlightening article. Thank you!